Lively Gemini zodiac and sensual Cancer zodiac are often attracted to each other, but deep down they have little in common. The auras of both zodiac moon signs will be with many shades because they both are so moody, restless and volatile. When their auras mix, it will represent every color of the spectrum. Both of them will be dreamers and expert in the art of getting publicity. Both rashis will have vivid imaginations and passionate in their lives. 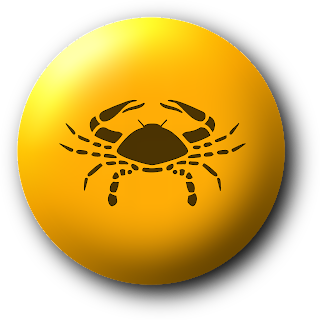 The crab of Cancer zodiac is highly emotional and sensitive, so can certainly a Gemini native's physical needs in the bed and romance in the mind. A flirtatious and restless Gemini can make a crab feel insecure, so an affair or a relationship be one of the key points of the attraction, unfortunately, the twin habit of Gemini is mutable and therefore natives born under this sign will prefer being the Big Boss and running the show while crab of zodiac Cancer is cardinal sign and natives born under this moon sign will definitely do not enjoy communicating their own secrets and prefer to run things not necessarily out from a brass band but still very much in charge. Usually Cancer zodiac sign people look for more commitment than a Gemini is likely to give, especially in the early stages of their relationship. In Indian astrology Cancer men and women seeks to protect, care and provide for loved ones and family and also wants ownership and possession with stability and security in life and in relationships they are in. There has to be similar interests in common between the two to carry on with the relationship together. 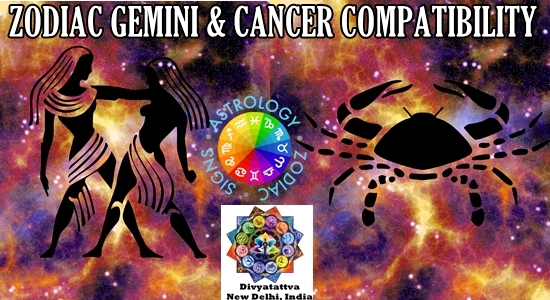 Sensual Cancer zodiac in jyotish is a watery sign and is ruled by the watery moon which is always changing, while the chatty Gemini is an airy zodiac sign in Hindu astrology ruled by communicative mercury. They can share,so that the energies can be put to work. 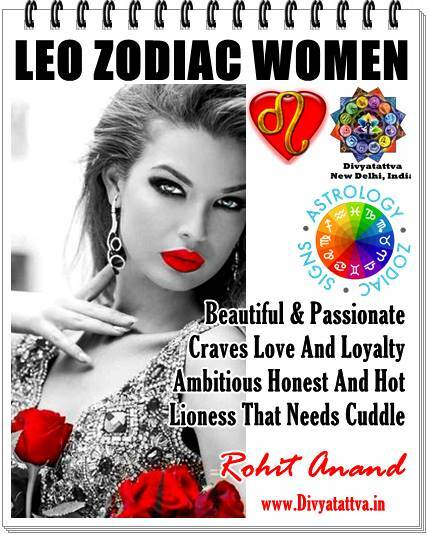 Cancer or Karka rashi is a light, while the Gemini Mithun rashi is more into social networking skills and lively command of language can be fantastic asset if harnessed constructively. This pattern where Gemini is behind the Cancer and the Cancer is immediately ahead the Gemini in Hindu astrology, Cancer women will secretly understand his restive nature from an unconscious soul memory imprint of what it was like to be careless and casual and free of strong emotional ties. The typical Gemini may not keep a wish for which he has no further need. He will be surely unable to understand her need to hang on to thing. Its more likely that he will not understand that with a zodiac Cancer women an interplanetary war is always a possibility and she wants to be prepared for it. He is likely to become impatient with her ingrained economical streak if she tries to transfer her financial fears to him. His more casual attitude towards human relationships will puzzle her. Zodiac Cancer men and Gemini women in bed or Cancer women and Gemini man in bed. In their physical or sexual relationship pure physical sensation will be less emphasized that the passions of the mind and a kind of emotional eroticism. Her soft affectionate tenderness and the vivid imagination will be a good balance for his delicate touch and his sensitive sexual nature. When they will be expressing their love on a physical level, they may even find that missing piece to be the puzzle of each other. Their most ideal sexual fulfillment may be frequently be experienced during the full moon. A Cancerian man lives in sensations, emotions and imaginations. When Cancerian possessiveness crosses sword with the Gemini insistence on freedom, the clash can cut into their dreams cruelly. They can find their share of happiness together but it will take patience on her part and some adaptability on his. It will not be so easy as her ruling planet mercury does not send out patient vibes and his ruling moon changes too frequently to count on any one phase remaining for long. 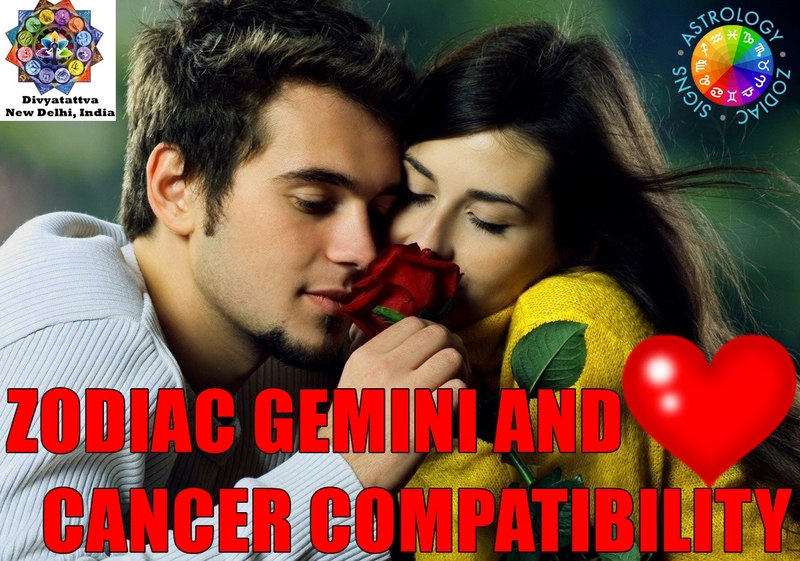 Gemini women and Cancer man relationship can so smoother only when Cancer man can accept outgoing nature of Gemini woman and she feels warm in warmth in the arms of Cancer man. Both can be usually affectionate, demanding, intuitive and adaptable to situations but crab needs to avoid the sting and be more open to Gemini ways of being social which may be to the disliking of crab. Get your personalized zodiac compatibility report, love astrology report, match making by India's top Vedic astrologer Shri Rohit Anand Ji by Email. 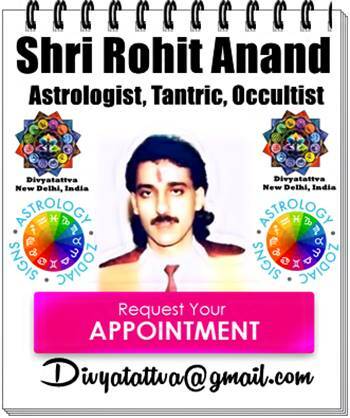 You can also consult him and seek guidance from him with prior appointment, whats app, skype.